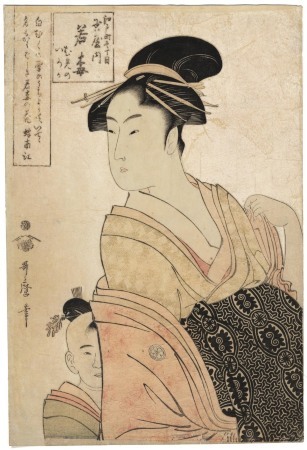 The print Courtesan Wakaume from the Tamaya is one of Utamaro's masterpieces. The work boasts good color, very good impression and state, but the luxury of this printing rests in the pink mica ground. This iridescent background enhances the elegance of the high-ranking beauty and Utamaro's exquisite composition. Printed straight to the paper, the ground mica created a silver-white surface, yet the printer could manipulate this effect by printing a color beneath the mica. In the case of Utamaro's Wakaume from Tamaya, the iridescent pink likely resulted from the under printing of a safflower rose. As mica is particularly vulnerable to humidity and handling, it is stunning that the mica ground remains so beautifully intact on this print. Wakaume was of the zashiki-mochi ("having her own suite") rank in the han magaki (half-lattice) brothel run by Tamaya Yahachi on the right side of Edō-chō 1-chōme, as you entered the street from Naka-no-chō. (This brothel was commonly known as the Yahachi Tamaya, to distinguish it from the several other establishments with the name Tamaya.) Together with Makiginu she was the high-ranked woman in this particular house, though somewhat lower in status than the high-ranked courtesans of more exclusive houses such as the Kado-Tamaya ("Corner Tamaya), Matsubaya or Ōgiya. Apparently a famous courtesan, she was frequently portrayed in Ukiyo-e prints. Nevertheless, it is hard to imagine this three-print set as being a commercial venture by the publisher Tsutaya, and it seems more likely they were sponsored.... The kyōka in the oblong poem-slip is by Hachi no Nankō and plays on the literal meaning of Wakaume's name, White Plum: "Blossoming from out of/Her snow white robe,/Even her name is fragrant -/The flower Wakaume [White Plum]". There is another copy of this print in the Japan Ukiyo-e Museum (日本浮世絵博物館).